Hoe and Shovel: what's your name? 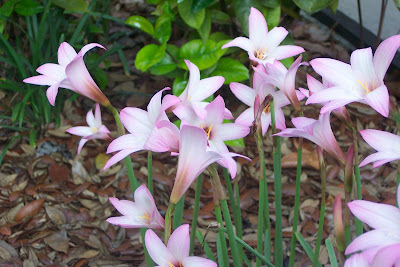 these delicate looking pink lilies bloom for only about a day and then as in waves, right behind them comes another blossom and bloom a few days later. i can't recall its name and i can't seem to find it in my research. they enjoy full sun. my next door neighbor has some planted right across the swath of grass from mine and strangely enough they bloom in the same rotation. one of the benefits of this sweet flower, besides the color and ease of maintenance, is that it multiplies itself quite readily.